Next review Bookvip - Not feeling the love !!!! The vacation packages offered by BookVIP are amazingly affordable because the resort partner is paying for 70% of the cost of these promotions. Due to the limited number of packages available, the resort partners set forth certain eligibility requirements to ensure that the packages are enjoyed by the guests for whom they are designed. 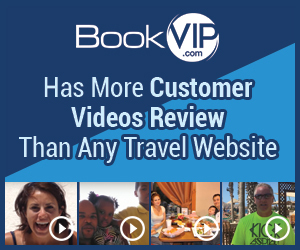 As the booking company, BookVIP must ensure that all guests are eligible for the promotional packages and that the requested dates are available before reservations are made and sent to the participating resort provider. Until this process is completed, there is no reservation. It is unfortunate that you booked your flights prior to having any reservation at all. A couple of days after you booked your vacation, BookVIP contacted you to let you know that payment was pending due to credit card decline. BookVIP honored your request to make partial payments and you moved resorts (at your request). Unfortunately, your credit card was declined once again. After updating your credit card information for a second time, the first partial payment cleared. You then sent BookVIP an email inquiring about a resort credit that had been a free gift under your promotion package and you were advised that when you moved resorts, the gift changed. The next (and last) contact BookVIP had with you was to collect your remaining balance, which was paid. BookVIP was unaware of any other issues until we received your recent review. Please note that it is the participating resort provider who issues the confirmation of your reservation. Information relating to resort confirmations (and contact information for your chosen resort) is contained in the Terms and Conditions governing your vacation package. Please refer to the Terms and Conditions you agreed to when you made your reservation and finalized your vacation package. We have an A+ rating with the Better Business Bureau, send over 100,000 people on vacation per year and have more customer video reviews than any other travel site. This has been the single worst experience booking a vacation. If I weren't so desperate for a vacation where I didn't have to worry about spending money when I got there I would have canceled long ago. I had plane tickets I had to use by 03/24/16. The price is great, but the hassle and stress, not so much. We are now less than a week away from leaving and still are not sure what hotel we are staying in since we have not gotten the final confirmation. First, don't get too comfortable (or set) on a specific hotel you will likely not get your first choice. We have now chosen 4 different resorts (more if you count the ones that were $700 more expensive and ruled out right away after talking to them and finding out what the price difference was) I booked my flight at the same time I was booking my vacation on line, having thought that the reservation I was booking on-line was good. Then the website says to call in to confirm. When you call in, they tell you that hotel is no longer available ( I guess so they can talk you into another more expensive hotel. I didn't like: Waiting until the last minute to get confirmation. Review #797482 is a subjective opinion of Tara25604.